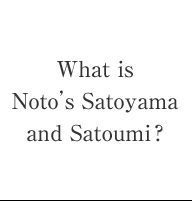 HOME > What is Noto's Satoyama and Satoumi? Satoyama is a term applied to a mosaic of socio-ecological systems such as villages, farmlands, secondary forests, artificial forests, grasslands, bamboo groves, and irrigation ponds that have been formed and maintained through long-term human influence. Satoyama are areas where people live and get their livelihood, and at the same time, are often inhabited by a variety of species adapted to and rely on these landscapes to survive, and to nurture their own culture, hence they play an important role in sustaining and enhancing biodiversity. Satoumi is a term for coastal areas which have a strong connection with peoples' livelihoods; an area where people lead their lives by acquiring the diverse riches of the sea. Satoumi is high in productivity and serves as habitat to an abundant ecosystem that provides an important place for sea creatures to spawn and raise their fries. Noto Peninsula's terrain is notable for its low mountains and hills. Because it is surrounded by sea on three sides, the shoreline is rich in diversity with shallow sandy beaches or rocky shores called Sotoura, and rias in coastal inlets with prominent ridges called Uchiura. The climate in the area is typical of Japan Seaside; it snows in the winter but due to the offshore Tsushima Current, it is relatively warm compared to the other regions in the same latitude. This means that a variety of species thrive, and flora and fauna adapted to warm and cold weather could be seen. 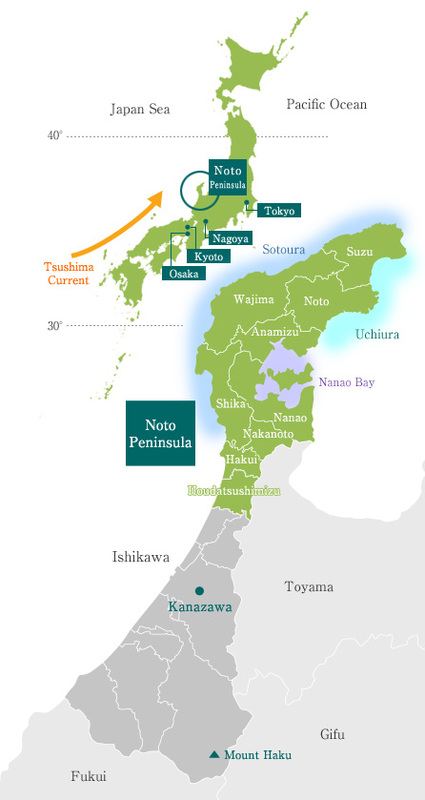 Noto Peninsula is an integral region closely linked together from Satoyama to Satoumi with land use, agriculture, forestry, and fisheries industries, culinary arts, festivals, arts and crafts, and biodiversity.